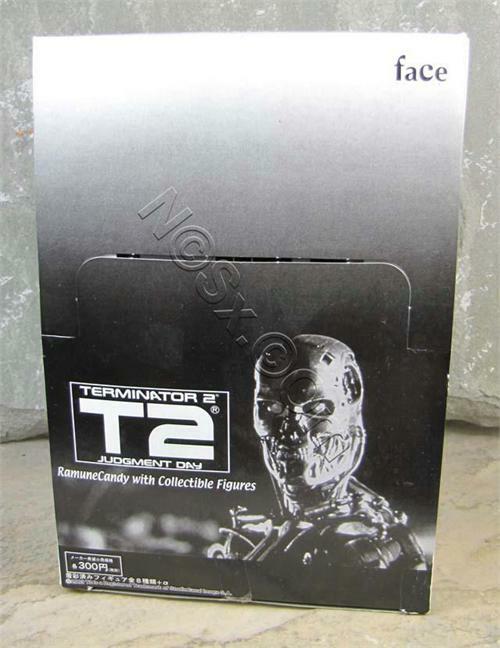 «©NCSX» With Terminator 3 hitting screens this summer, toy manufacturer Face revisits Terminator 2 with a candy toy set. Eight standard toys are possible in each factory-sealed box (view the photos below, to the left) and there's also a super-secret figure (Terminator 2 endo-skeleton arm) randomly packaged inside a Master Case as a bonus. 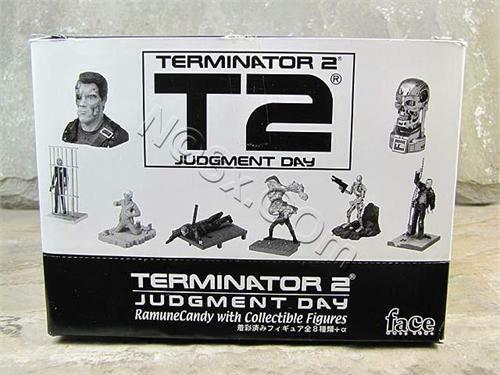 Please note that NCS only sells the Terminator 2 Candy Toys in a complete factory box of 10 which is not guaranteed to contain the entire set of 8 figures. Back in 2003, we opened up six complete boxes of the Terminator 2 toys to slake our curiosity on how the toys were allocated. Back then, toy manufacturers weren't as cool as they are today. The T2 toy manufacturer "Face" wasn't cool. To make people buy boxes of toys in a tiresome quest to find a complete set of figures, Face included at least two duplicates in every box which meant it was impossible to get a complete set of 8 toys if a customer purchased only 1 box. For example, in one of our factory boxes which we kept in its original condition, there were two Terminator Heads and two crawling Arnolds. 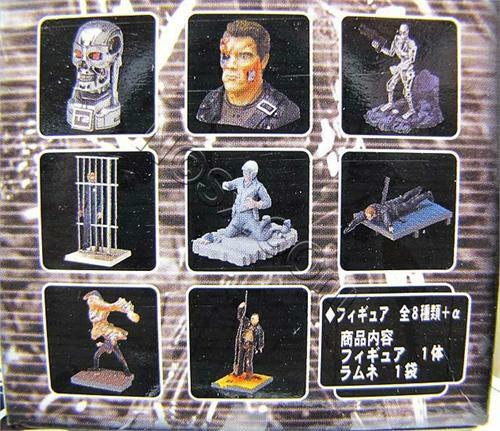 This particular box was missing the busted up T-1000 which may be seen on the lower-left corner of the toy collage pic. Out of the six boxes we opened, we got "one" secret T2 Endo-skeleton arm. 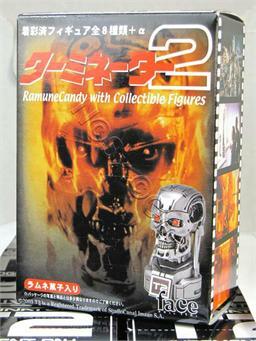 Every individual T2 figure is packaged with a little baggie of Ramune Candy. Each baggie contains 18 pieces of candy which has a sweet/sour taste. Please note however that the expiration date of the Ramune that is stamped on every box is July 2004. That was six years ago. Due to this expiration, NCS recommends that the Ramune not be eaten although you can probably feed it to ants and roaches who'll appreciate the sweet treat. NCS' remaining inventory is brand new and factory boxed in the original cardboard containers. The packaging is in very good structural shape with only a few slight dings, creases, or tears caused by years of warehouse-to-warehouse transportation and storage. This document is ©NCSX 2003, 2010. All rights reserved. No reproduction in whole or in part of this document may be made without express written consent of National Console Support, Inc. In post-apocalyptic 2018, Skynet prepares its army of Terminator's to destroy mankind. At the heart of each Terminator is a Nuclear Fuel Cell embedded in its chest. We don't remember a whole lot about Terminator Salvation other than the kiss the convict got when he agreed to be a guinea pig at the beginning of the movie. Terminator Salvation T-600 Skin Damage Ver. Hot Toys has started preorders for a Terminator Salvation T-600 sculpture which stars a rag-covered robot that's definitely seen better days. Timex has started preorders for a limited edition Terminator Salvation Timex watch which is based on the "Ironman Triathlon 50-Lap Sleek" design.